The “gloomy” stadium scenarios exhibited by Italian football is one of the most debated issues in the country’s sporting context. Data on individual match and season tickets show that, after the peaks around the middle of the 80s, Serie A and B average attendance has reduced by about 40% and 60%, respectively. If we consider in particular the exploitation of stadium capacity, last season it was approximately 50%. This figure is significantly lower than other European football top leagues. In fact, capacity was 67% in French Ligue 1, 73% in the Liga, 91% in the Premier League and 93% in the Bundesliga. The trough was reached in the 2006-07 season when, for the first time ever, the average attendance was below 20,000. The low figure had been driven by the relegation to Serie B of Juventus FC due to the referees scandals known as calciopoli. Needless to say, stadium depopulation has had a predictable detrimental economic effect: gate revenues almost halved from about €300 million (at constant €/2010) registered at the end of 80s, becoming an minor share of Italian teams’ total revenues (FIGC Report 2012). This is still the case for top teams playing in European tournaments (Deloitte 2012). What is behind the fall in attendance? Stadium depopulation is not a recent phenomenon, however (Di Domizi 2007). Several factors may have contributed to this critical situation – structural inadequacy of old stadiums; competing TV coverage; and loss of credibility due to match-fixing and betting scandals (Caruso 2009). 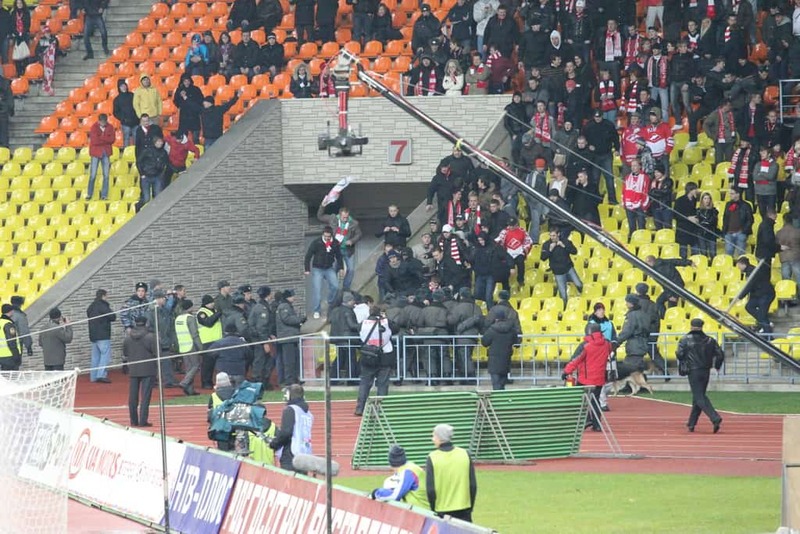 In addition, football matches are often perceived to be a violent and risky environment because of hooliganism. In fact, in spite of the peak in average attendance reached in the 1984-85 season (about 38,000), a pernicious underlying “viral disease” has emerged since 1979-80, the season in which a big match-fixing scandal emerged in Serie A. Moreover, a number of violent incidents inside stadiums reached a peak with the death of a SS LAZIO fan Vincenzo Paparelli hit by a rocket shot by AS ROMA supporters on 28th October 1979 at the Stadio Olimpico. After that incident, sales of game tickets decreased progressively, being only partially compensated by the growth of season tickets. Evidently, the net effect on average attendance has been undoubtedly negative. The reduction has gone hand-in-hand with violent incidents inside and outside stadiums, and with scandals undermining football competitions’ credibility. In the last decade, hooliganism took the shape of “anti-system action” as many hooligan groups became allied against the police. The National Observatory on Sport Events, created by the Italian government in 1999 to analyse the phenomenon of hooliganism and to propose and implement effective counter-strategies, turned out to be unable to stem the attitude of vandalism among violent fans. So another bloody peak was reached in recent years, the death of the policeman Filippo Raciti, killed during clashes that occurred before the derby between Catania and Palermo on February 2007. This prompted the Italian government to introduce sharper counter-measures in order to banish violence from Italian stadiums. The current strategy is centred on several points: i) closure of unlawful stadiums; ii) prohibition of sales of cumulative tickets for away team fans; iii) harsher punishment for hooligans; iv) penalties for clubs supporting fans organizations involved in hooliganism. Since 2008 (Decree of 15th August), the Observatory’s activity has been supported by the Committee for the Analysis and Safety of Sport Manifestations, which has the power to introduce restrictions on the basis of the risk profile of a match as reported by the Observatory. Such restrictions can be classified by deterrence strength: a) no spectators admitted; b) admittance restricted to season ticket holders only; c) forbidden areas for away team fans in the stadium neighbourhood; d) on-site sale of game tickets restricted only to the residents of region, province or town of the home team; e) no collective sale of game tickets. In addition, the anti-violence strategy gave the clubs the opportunity to stipulate some conventions or agreements in order to promote the values and culture of sport, in particular those of peaceful coexistence and competition. This opened the way for a membership process between clubs and fans, institutionalized by the “fan card” strategy. The project, approved in May 2008 and successively regulated by the Decree of 15 August 2009, was designed to be a basic tool able to implement a new and transparent type of link between clubs and fans. It became mandatory in the 2010-11 season for season ticket holders, but it met with strong opposition and disagreement. In fact, various aspects of the policy have been criticized: the profiling mechanism of fans, the exclusion of fans banned from a stadium in the previous five years and the business-associated initiatives. These criticisms prompted some changes with respect to the initial framework. The supreme administrative Italian court, in addition, declared the fan card card illegal because of the inclusion of a revolving credit card released by a commercial bank. But the idea of entry restrictions for occasional fans, in all professional football divisions, still remains. Have the efforts been successful? What has been the effect of the fan card experiment on attendance? Using panel data on Serie A from the 2007-08 to 2011-12 seasons, we estimated a fixed effect model searching for variables influencing sales of game tickets at the single match level (Caruso and Di Domizio 2012). In particular, we controlled for the relevance of risk profiles on attendance and of restriction exemptions for fan card owners. The econometric investigation shows that the restriction exemptions allowed to the fan card owners were not able to compensate the initial boundaries. The net effect of the counter-violence strategy could be quantified at around 1,300 fewer tickets sold per game. Even though the new strategies were able to reduce the perceived risk, they have not reversed the negative tendency of stadium depopulation that appears to be, at the moment, one the most important shortcomings of Italian professional football. Since the crisis in football’s reputation is going hand-in-hand with a severe economic crisis, leagues, federation managers, teams and government are nowadays called on to come up with new ideas and policies in order to restore the credibility and the success of football. Put briefly, the issues are related to limiting TV coverage of matches, redistributing revenues from TV rights to reward teams achieving a higher percentage of stadium capacity, and supporting new investments in stadium facilities in order to create more suitable and entertaining environment for fans’ live participation. In this vein, a more direct involvement of committed fans in the decision-making process of teams and leagues may be desirable. For example, why not involve fan card holders in a democratic process of executives’ decisions on football governance?